With the sudden drop in temperatures I can not help but want to throw on a cozy knit sweater. For years I have always lacked a great basic grey crewneck sweater in my closet. So when I started to think about what I should put on my "Winter Wardrobe" wish list it was the first thing I added. What I'm looking for in this sweater is something that I can dress up or down, wear to work and on days off, and just be warm and toasty in it. Here are a few that I'm looking at and waiting to go on sale. I love grey! and I love jumpers. So yes, grey jumpers=instant love! 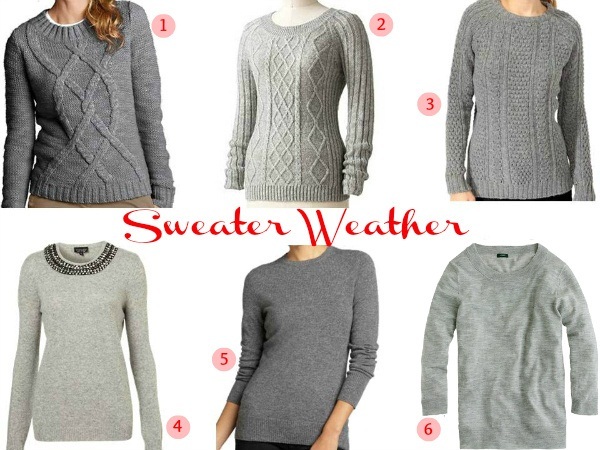 I have been slowly trying to beef up my sweater collection too - definitely need a cozy gray option and these are great picks...I think my favorite is #1! I have been buying sweaters non-stop lately, especially in white and gray. I adore the first three picks. Cable knits are my current obsession! So classic and versatile!